It's easy to make your table stand out from the rest this Easter using a mix of authentic vintage items, high street finds, floral fabrics, Easter candles and lots of pretty pastel eggs. Think colour. You can go traditional pastels or really bright and fun, but either way go for more than two colours if you want to stand out from the crowd. Pick a stand-out table cloth, something full of colour or with some coloured embroidery. I've used vintage Sanderson material here. Buy some beautiful Spring flowers to form a centrepiece and display them in a jug or spring-like vase. I popped my jug of tulips on a mirrored tray for added effect. Use pretty china, ideally vintage and floral. I've gone for my favourite vintage gold & floral set and have taken this one step further by using gold cutlery. This was bought from George at Asda for £20 and I chose it as I just loved the look of continuing the gold throughout. 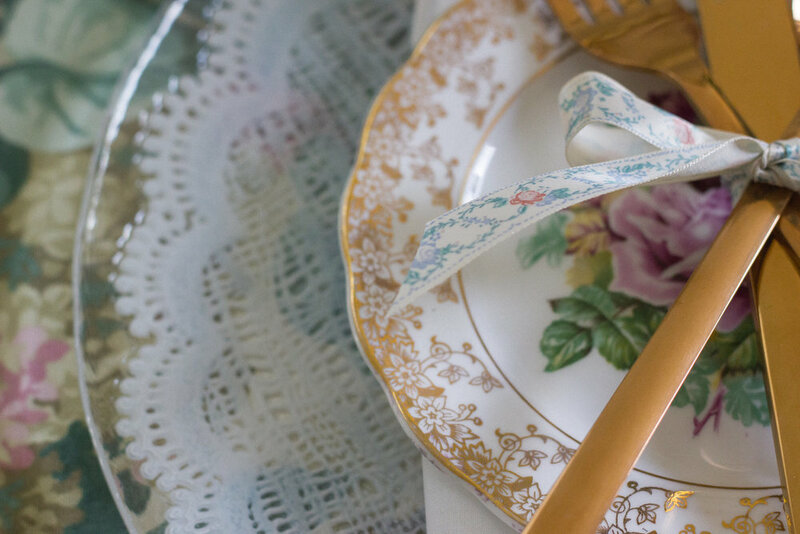 I then tied the cutlery with vintage ribbon, in a complementary pattern, and then spread it out on the plate. Use charger plates to make a statement. These are not vintage but I love their vintage feel as if they have a doily on them. They are glass and from Homesense at £4 for one. Always build them up with napkins and smaller plates, to add texture and detail. You could also pop the tea cup on top of the side plate to add an additional layer. Choose coordinating napkins. By coordinating I mean with the scheme and not necessarily the tablecloth. For this table styling I have used my vintage plain white napkins, that pick out the white in the tablecloth and china. Candles are not just for Winter. These pretty Easter candles are also from Homesense and I just love their detail and the colour of them. I have popped them on vintage saucers that compliment the rest of the china but allow them to stand out. Although I felt they were too pretty to light! Use cute Easter themed finishing touches. These are often a very reasonable way of adding character and detail. For example here I have scattered large pastel chocolate eggs and added some kitsch pink bunnies in a set of 3. I have also used a hand-made vintage printed pillow with an Easter design from the very talented The Blueberry Patch. So there you have it. I think this table has a dramatic effect whilst still being soft and very feminine, and of course full of vintage items and style. This would also make a beautiful styled table for a romantic vintage wedding, with a whimsical feel. What do you think? Are you styling a table this Easter? Would love to see your styled tables. A lot of the items you see in these pictures are available to hire from me for your wedding or event. Let me know if you would like to discuss my styling or hiring packages. All photos are taken by the very talented Katie Rogers Photography, isn't she talented?